Columbia Children's Arboretum - Final Opportunity to Provide Feedback! For those of you who were not able to attend the Open House on Saturday, October 6th – please take a moment to click on the link below! You will get to see the draft designs and give us your feedback! Columbia Children's Arboretum - Final Survey! Plans for the Columbia Children's Arboretum improvement project can be found on the Parks Department's website here. All ECNA folks are invited to attend the upcoming work parties. 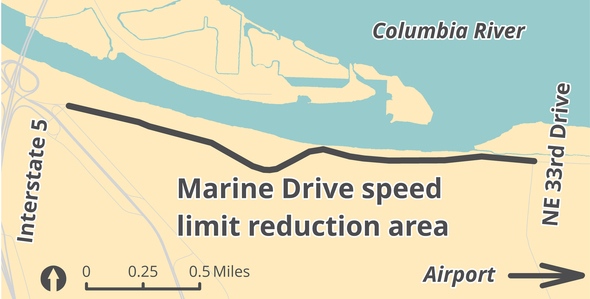 (Sept. 24, 2018) -- The Portland Bureau of Transportation will reduce the speed limit on a two-mile stretch of North Marine Drive, between Interstate 5 and NE 33rd Drive, starting Tuesday Sept. 25, from 40 mph to 35 mph. PBOT won state approval for the change, as part of the City's Vision Zero effort to eliminate traffic fatalities and serious injuries, on Aug. 30. There were 140 reported crashes, including six people seriously injured, on this segment of Marine Drive, where the speed limit will be reduced, from 2012 to 2016, the most recent five-year period for which data are available. The Speed Safety Camera on eastbound NE Marine Drive, which were installed in February, will issue warnings starting Tuesday for two weeks. Citations will resume Oct. 10. 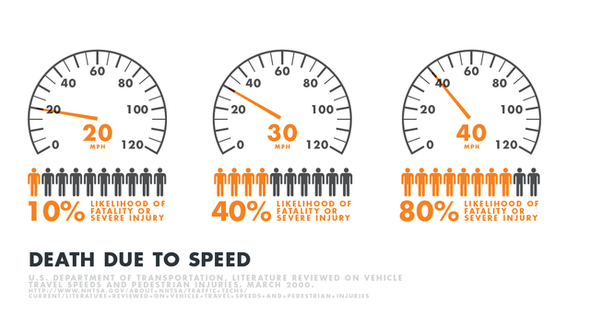 The goal of the Speed Safety Camera program is to reduce speeding and save lives. Marine Drive is one of 30 streets that comprise Portland's High Crash Network. The roads in this network make up just 8 percent of Portland streets, but account for 57 percent of fatal crashes citywide. The cameras are located in two locations on the corridor – westbound near NE 138th Avenue and eastbound near NE 33rd Avenue. The speed limit is not changing near the NE 138th Avenue cameras, so enforcement there will not be effected. *19% of crashes on Marine Drive are lane departure crashes where a person drives out of their travel lane. On average, centerline rumble strips reduce all crash types by 9% and head-on or sideswipe crashes (which are often serious) by 44%. On average, shoulder rumble strips reduce crashes by 36%. The City of Portland has joined cities around the country in embracing Vision Zero – the notion that the death of even one person on our roads is one too many. Vision Zero prevents traffic deaths through smart policy and system design. Learn more about Vision Zero and Speed Safety Cameras by visiting www.visionzeroportland.com. The Portland Bureau of Transportation (PBOT) is the steward of the City’s transportation system, and a community partner in shaping a livable city. We plan, build, manage and maintain an effective and safe transportation system that provides access and mobility. Learn more at www.portlandoregon.gov/transportation.